Daphnila Bay Dassia literally tumbles down the green hillside overlooking the bay and Ionian sea. From the main building high up the slope to the garden bungalows hidden amongst the mature gardens, the fresh scent of pine fills the air. 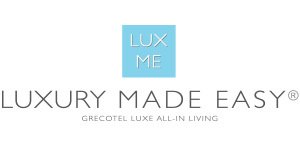 Relax in the completely remastered Daphnila Bay and indulge in the unlimited lux me options without a care in the world. A concierge service for all guests, where designated staff members are at your call on WhatsApp, to assist you on everything you may desire. A quiet sandy beach bordered by spacious, naturally-shaded lawns, 1 freshwater pool, 1 children’s pool & 1 Indoor heated Thalasso pool. Amazing choice of family accommodation. Kids Tasty Corner dining. GrecoBaby, the solution to travelling with babies & tots! Grecoland specialized programs. Baby-sitting upon request, not included. Full of music in live acts, super DJ shows, dancing, movies, kid’s shows, parties & disco night club. Breathe in the sea. Fitness is the trend, even for beginners. Visiting fitness masters is a LUX.ME highlight. Fitness room available. Visit traditional Danilia, Grecotel’s authentic, colourful and private Village and taste recipes of the exquisite Corfiot cuisine. Transfer not included. An oasis of relaxation! Facilities include Aqua Elixir Thalasso Pool, whirlpool, sauna, steam room, private massage rooms, beauty salon and fitness room. Treatments not included. Daily stocked mini bar, tea+coffee set up, Wi-Fi, safe & luxury amenities are free of charge. A world of choices on the waterfront: 6 restaurants, ONE 24/7, a pâtisserie & chocolaterie, creperie & gelateria, premium brands, snacks & ice Bars, pool+beach service and not-to-tell Grecotel’s little luxuries. Petite gastronomie, farm to table veg+fruit and baby food sur mesure in all restaurants. During the day we tempt you with a choice of canapés, sandwiches, from a Cretan, Asian & Italian selection. A remarkable range of premium brands, cocktails, healthy juices, a wide selection of more than 150 unique labels of local and international wines, indelibly linked to the a la carte Menus.